The reddish orange rising full Moon has the similar colorcast that occurs with the rising or setting Sun. This colorcast is caused by the atmosphere scattering of the blue spectrum of Moon light and Sun light. Also, this scattering of blue light results in the blue sky we see. Directly overhead is the least amount of atmosphere that the light has to pass through. The reduction of light caused by the atmosphere is call atmosphere absorption and can reduce light by three magnitudes for celestial objects on the horizon. This is why it is best to observe celestial objects when they are overhead or as close as possible to being overhead. When celestial objects are on the horizon their light passes through the maximum amount of astrosphere and they are dimmer. Being dimmer is the reason we can look directly at the setting Sun but cannot look directly at the Sun overhead. Also, the rising and setting Moon light and Sun light has the maximum amount of blue light being scattered. 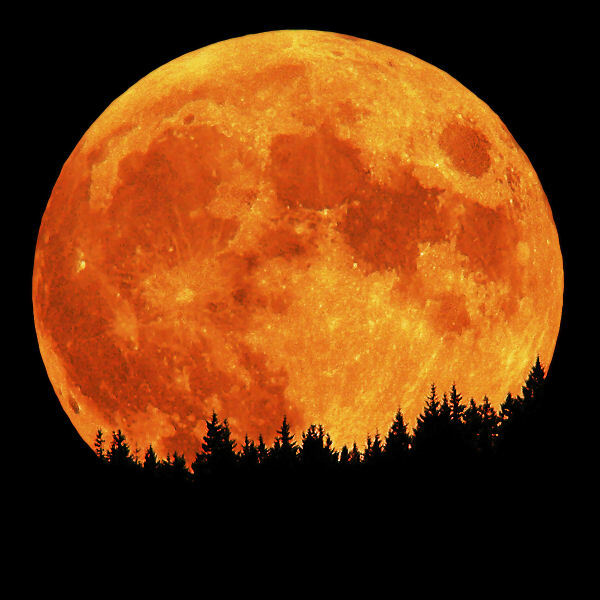 Therefore, like in the above image we see a red to orange colored Moon and later in the evening when the Moon is high in the sky it will be shinning white and much brighter. Moon light and Sun light can further be changed by the light clouds, dust and other particles in the astrosphere. The moons of the year have different names depending upon different traditions and civilizations. For example, one list of Moon names includes Wolf, Snow, Worm, Pink, Flower, Strawberry, Buck, Sturgeon, Harvest, Hunter's, Beaver and Cold Moon. In the Northern hemisphere the September Harvest Moon provides more evening light hours after Sunset for harvesting crops. This is because of the Moon’s small rising angle with the horizon results in the smallest difference in Moonrise time from day to day in September as compared to the other full moons of the year. The above Harvest full Moon rise over the Cascade Mountains was taken on Saturday evening on September 17, 2005 at Cape Horn above the Columbia river in Washington state seven miles east of Washougal city.